If your company makes any food products that are sold at Walmart, you are no doubt aware of the changes in barcoding for shipping cases that Walmart is currently introducing. A lot of companies are wondering whether they really need to comply with this, but there is no question that when you ship your products into the supply chain, it is important that your barcoding is the best possible quality. The readability of a barcode isn’t subjective – it can be measured against the ISO/IEC 15416 standard for barcode print quality. When verifying a barcode against the standard, a number of parameters are measured and an overall grade produced that ranges from “A” (best) to “F” (fail). Because one parameter that is measured is contrast, the best scoring (most readable) grades are achieved by printing a black barcode on a white background – usually on a label. Printing directly onto a corrugated case has lower contrast and is always more difficult for the scanner to read, even if everything is set up and maintained perfectly. See section 5.5.3.3.10.5 of the GS1 General Specifications. 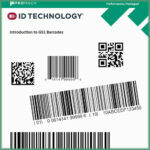 At ID Technology, we specialize in labeling for shipping cases and we have two technologies available to ensure that the barcodes on the cases you ship are the best possible quality – every time. Our pre-printed barcode labels are printed on one of our flexo or digital label presses, using the best materials on the market. We have six label printing plants across North America where our flexo and HP Indigo digital presses produce printed barcode labels for a wide range of customers. We can cost effectively print small quantities of labels as well as having the capacity for even the largest labeling jobs. We ensure that every print job meets the GS1 and ISO barcode specifications. After we deliver your labels, you can use your ID Technology applicator to apply them to your products. Our label applicators, such as our ST1000 or M-Series are built tough – designed to apply your labels accurately and efficiently year after year. ID Technology is the market leader in print and apply labeling, with our range of systems built on the best-selling 252 system. The 252 product line is of modular construction and can be configured for just about every application. Our customers have a choice of OEM print engine (can handle both direct thermal and thermal transfer labels) and can use our standard controls or our new PackML compliant system with enhanced communications. Direct wipe or merge application. The modularity of our labeling systems means they can be easily adapted to handle different jobs should your needs change. We are often asked which makes the most sense, buy pre-printed labels or purchase blank ones and print them at the time of application. To be honest, it depends on the volumes and mix of products. If your packaging line runs a small number of SKUs with few product changeovers, using pre-printed labels makes a lot of sense. On the other hand, if you have to label a lot of SKUs and change over frequently, purchasing blank labels and printing and applying them on-line could be the best solution. Only one label to handle in inventory, no constantly changing rolls when the next SKU needs to be run and new products just need a tweak in your label design software. Many ID Technology customers take advantage of our complimentary Lifetime Warranty for our labeling equipment. We are so confident in the quality of our labeling equipment, we’ll provide you with a free warranty for as long as you use our labels. When you print barcodes, you need to know that they are scannable and that the data structure is correct. Our IDSee! barcode scanning solution is integrated into our labeling systems and gives you the peace of mind of knowing that every product you ship to your customers is correctly designed and printed. IDSee! systems can validate your linear and 2D barcodes and can even inspect printed text on your labels. How Does Your Barcoding Stack Up? Our team has been involved in barcoding and labeling for a long time and we’ve seen all kinds of situations – the good and the bad. We’d love to share our expertise with you. You can take advantage of our expertise by arranging for one of our labeling specialists to call by your plant to review what you today and help you plan for the future. Contact us today at 888-438-3242 Option#3 or you can contact me directly at dholliday@idtechnology.com. We’ll get you in touch with one of our ID Technology barcode specialists right in your area. Hi Michael, that’s an interesting problem. I assume it isn’t possible for you to print the barcodes with the correct ratio for the modules.